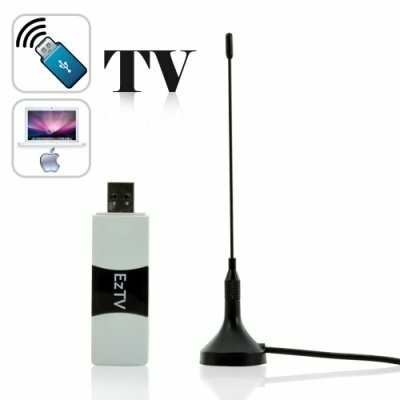 Successfully Added USB Digital TV Stick (DVB-T For Your Mac) to your Shopping Cart. This amazing device lets you receive and record free DVB-T digital TV on your Apple Macintosh computer! Just plug it into your USB port, run the free included software, and you'll be watching and recording digital TV on your Mac in seconds! This USB digital TV stick self detects your DVB-T region and automatically scans all available digital TV channels and adds them to your channel roster. Watch movies, TV shows, news, sports, and lots more! When you see something you like, you can record a program immediately to your hard disk drive (HDD) or make use of the timeshift function and you've got yourself a modest TiVo alternative. But at a much better price and without the monthly TiVo fees of course! This remarkable USB accessory is actually the world's greatest computer Mac upgrade. It's compatible with your Mac desktop (iMac, Mac Pro, Mac mini), and Mac notebook (MacBook, MacBook Pro, MacBook Air) running Mac OS X.
Click "add to cart" right now and we'll ship it out the very next day. Another innovative digital TV product from the leader in China wholesale electronics - Chinavasion. Genuine full version software included! Higher quality MPEG-4 encoded DVB-T receiver! Less than 3 lattes at Starbucks! This product only works on a Mac computer. Licensed full version DVR software included. This unit supports DVB-T MPEG-4 broadcasts.